Allah is the BESOUGHT of All, every existing thing resorts to Him in the time of need; for His help is besought and required byall His creatures, and to His Mercy they turn. He needs neither foodnor water as He has no inside. He is too Exalted for defects, He is theEverlasting Who never perishes. Allah is the Lord Who achieves perfection in His Kingdom, the Honourable Whose Honour is supreme, the Great and Righteous Whose Greatness and Integrity are perfect; the Most Forbearing, the Omniscient, the All-Wise Whose Knowledge and Wisdom are absolute. Allah is theOne Who is Perfect in sovereignty and honour, He is the Everlasting. Hebegets not, nor is He begotten. Nothing ever resembles Him. 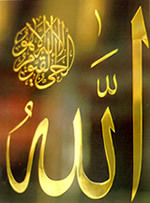 Praise and Glorybe to Him, He is Allah.